The standard equipment for the home brewer: a 6-gallon glass “carboy,” a device that fits right on top of the carboy rim called a universal carboy cap, and an air lock. Although I’m a scientist by trade, I’ve also joined the ranks of home/craft beer makers, and have done a fair bit of brewing myself. Despite seemingly endless beer varieties, beer making boils down to just a few basic ingredients. So what’s really happening during the major steps in the brewing process? And what do all those colorful beer-making terms mean? The basic brewing process begins with grains—generally barley, but also rice, wheat, and/or sorghum. Botanically speaking, grains are grasses with a special type of seed called a caryopsis. Inside a caryopsis is an embryo and a large, starchy food reserve (called the endosperm) that plays a key role in the beer-making process. As a grain seed germinates, its food reserve is converted from starch into smaller carbohydrates. This conversion process is important for the brewer, since those carbohydrates will feed the yeasts during fermentation. The brewer doesn’t want the grain seed to completely germinate, though—if it did, the embryo would “eat” all of the food reserves, leaving none for the yeast. Instead, grains are only partially germinated, just enough for their starch-converting enzymes to become active. Then the grains are gently heated and dried, so that the enzymes stay active (it’s called diastic power), but the embryo remains inactive. It’s a process known as malting, and its end-product is the key ingredient in most beers: barley malt. By treating barley malts differently, the brewer can create different colors, flavors, and sweetness levels in their brew. Roasting, for example, affects depth of color and flavor, while using malts with different diastic powers—that ability to convert starch into sugar—affects sweetness. 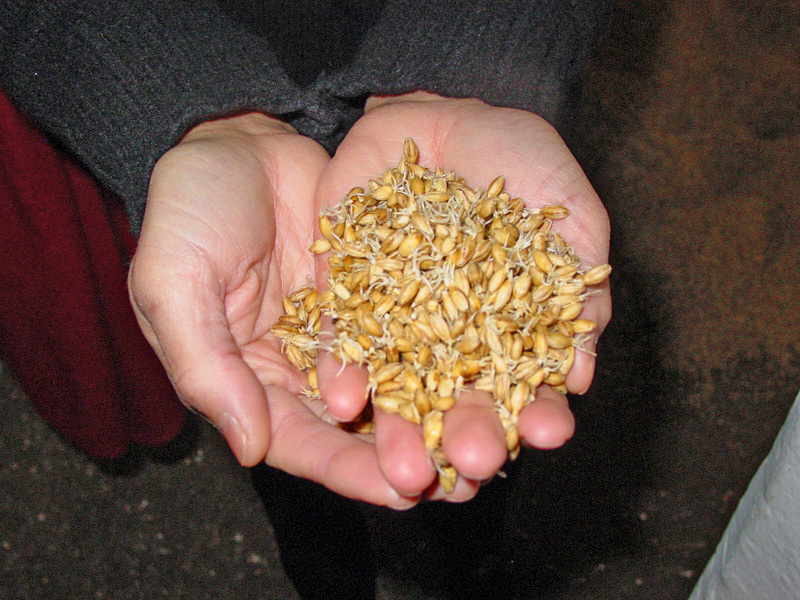 The blending of barleys and barley malts (plus other grains) is part of the art of brewing beer. In the process called mashing, malt sugars are extracted from the barley by adding hot water during the starch-converting process. Water dissolves the starches so they leach out of the cracked grain, creating the wort, which is like a syrupy malt tea. Already-prepared malts—and even malt-extract syrups—allow the home brewer to skip the mashing process. Home brewers can simply turn up the heat on malt syrup plus hot water to boil the wort—an important step that denatures, or kills, the enzymes that convert starches into sugar. This kills any microorganisms and bacteria in the process, too. Now the art continues, as the brewer can control fermentation and flavor with yeasts and hops. 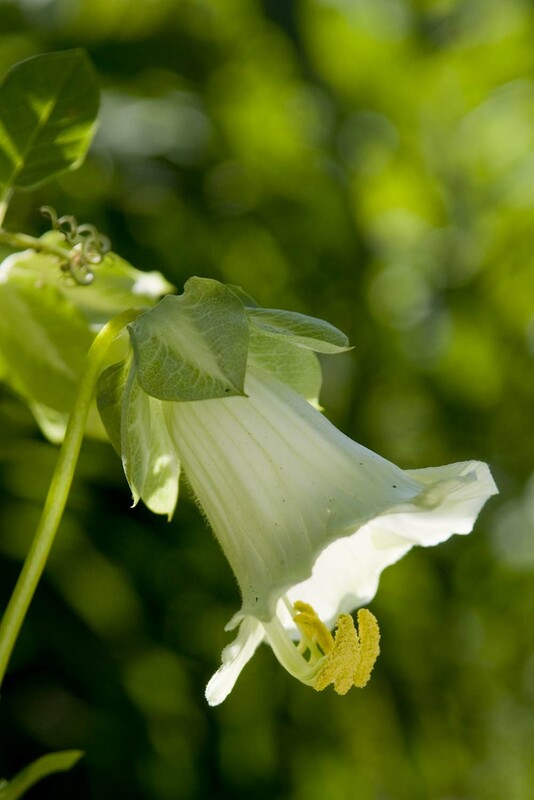 A beautiful vine for the home garden is hops (Humulus lupulus), pictured here in flower. Pollinated and fruited in fall, these pale green hops “cones” supply the resins that give beer its bitter (or bright) flavor. 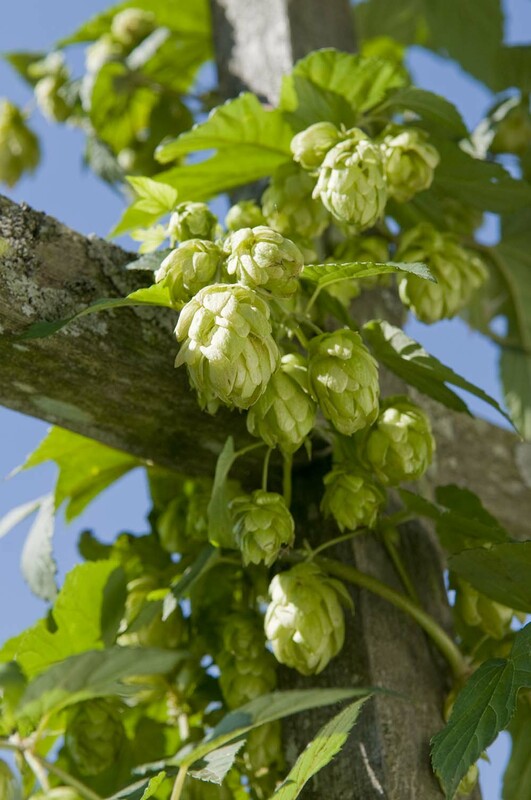 Hops add flavor—described from bitter to bright—and can be introduced at the beginning of the boil, midway through, or as finishing hops at boil’s end. Timing plus variety choice (more than 80 varieties of hops are available) determine flavor. Bitter flavor is the result of adding hops at the beginning of the boil, while the characteristic bright, hoppy flavor of India pale ales comes from hops added to the cask after fermentation. Yeast gets added after the wort has cooled sufficiently, in a process called pitching. There are two yeast groups to choose from. Ale yeasts, which work at the top of the fermentation tank, produce ales, porters, stouts, Altbier, Kölsch, and wheat beers. Ale yeasts prefer warm temperatures, going dormant below about 55 degrees Fahrenheit. Lager yeasts, which prefer the bottom of the tank, yield Pilsners, Dortmunders, Märzen, Bocks, and American malt liquors, and work happily at 40 degrees F.
Yeasts contribute to flavor, too, creating secondary metabolites such as the phenolics that give German wheat beers their characteristic clovelike flavor. Brewers can experiment with yeasts: California common beers, such as Anchor Steam Ale, were created by adding lager yeasts at ale temperatures (60-70 degrees F.). Porter, lager, stout, and ale: different malt blends and yeasts create different brews. Fermentation is a preserving process known since Neolithic times: beer, wine, pickles, sauerkraut, and hot pepper sauces are all fermented. Yeasts cause fermentation by converting the sugar in the wort to alcohol. When yeasts—either dry or liquid—are pitched into a well-aerated wort, a controlled population explosion occurs. Yeasts suddenly go into metabolic overtime, reproducing at a rapid rate. Fermentation begins as sugars are consumed. The amount of sugar in the wort, the temperature at fermentation, and the type of yeast pitched determine the metabolic byproducts: alcohol and CO2. Fermentation is a two-stage process. Primary fermentation occurs after the controlled population explosion, and begins to subside, or attenuate, as the alcohol content increases. Alcohol rises to the top of the fermentation tank, while most of the yeasts fall to the bottom and become inactive. (Some do not.) Most brewers transfer the wort to a secondary fermentation tank at this point; the second fermentation occurs more slowly, and conditions the beer as the more complex sugars are converted. Once the beer is fully conditioned, it’s bottled or transferred to a cask or keg. Think about the science next time you speak the language of beer and order a light, crisp, transparent American lager…a rich, creamy, almost-opaque stout…or something in between. And which kind of beer most appeals to me? I often have trouble choosing between a bright, crisp India pale ale such as Sierra Nevada, or something a lot darker, like a Guinness. I guess I’m just a fan-atic!